Tonight at the book club meeting I sat at the table with this radio in front of me for the evening. I knew it had a story and the hostess just wrote to tell me I left my notebook where I had jotted down what I needed to know about the radio’s history. I remembered the location of Beaconsfield Street in Detroit. Here is what Lisa B. wrote to me just now about this radio from her husband’s family. Zenith Radio Model 12-s-370. 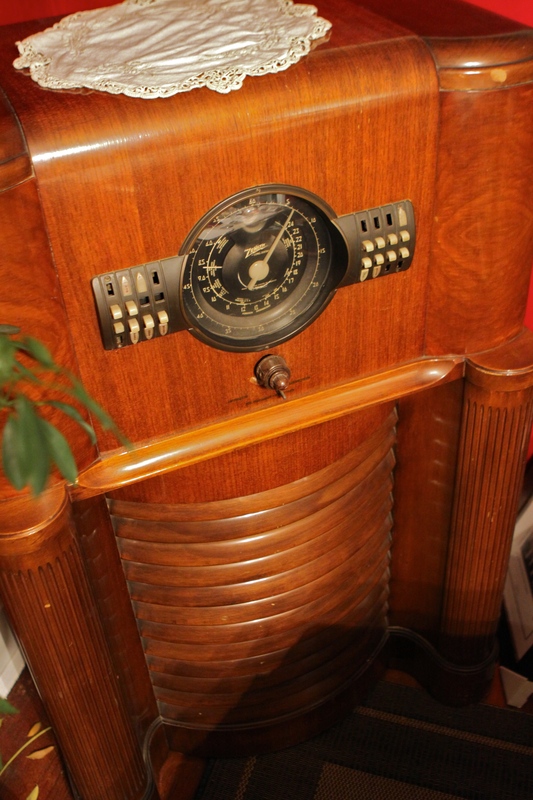 found online Antique Radio Museum. What You Should Never Eat- But Tastes Great! Ruth, I love beginning my day with your stories and your art. You have started your own virtual museum with all of your great posts. Now we listen with plugs in our ears. No longer a family event. Its a little bigger than my ipod shuffle. That is an amazing piece and an amazing story. I like how much of it you got in the shot. It was huge. I remember these radios from my youth! Is it still in use? Wouldn’t it be interesting to know more!!!! When I compare this with actual design, I think, something has been lost. With a plastic-Jesus on top it would be great. Yes, that would top it off for sure!